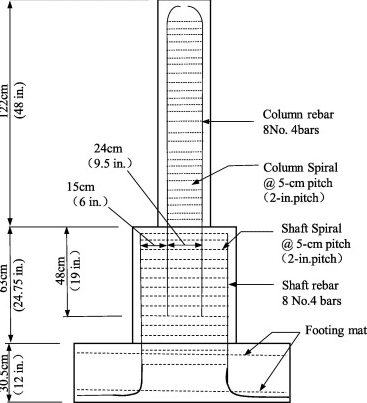 If the column face of a column above a floor is set back > 75 mm (3") from the column face of the column immediately below, and vertical dowels are used to lap with the vertical bars in the column, these dowels will be separated from the vertical bars in the column below by > 75 mm (3"). 1. Is there any Code requirement on how close the bars in a compression lap splice must be, in order for the Code expressions for compression lap lengths to be valid? 2. If so, what happens if that limit is exceeded? How long a lap length would you use in that case? I ask this questions as part of my review and revising/updating of all our typical details, and not in reference to any specific project. The Standard to which I refer is CSA A23.3-2014, but I would be interested in what other Standards such as, but not limited to, ACI-318 and the Australian Standard. I am not aware of any code mandating the distance of lapping bar. The way I look at it is (a) the arrangement isn't unreasonable, (b) the 75mm separation isn't out of this world as normal bar spacing would be above this dimension and (c) one can demand the bar to be cranked but this may not work for large diameter bars. I would negotiate with the designer saying you would like to see this compression lap to be upgraded/lengthened to a full tension lap. If the column is already designed with these bars in tension then a modest increase of lap length say from 42D to 45D or 48D (48 times the diameter of bar) should mitigate the unknown risk. There is no "negotiation with the designer"; as I stated in the question, this is about our typical detail update, not about a particular project, and therefore there is no designer. I do not know what you mean by 75 mm separation of the lapped bars being not unreasonable, and what that has to do with spacing of unlapped bars. I am talking about 150 mm separation of the lapped spliced bars, for example. I don't think cranked bars with 150 mm are permissible in compression members (that is why our detail shows added dowels rather than the cranked bars that we show when the offset is ≤ 75 mm), but I will check the Code. 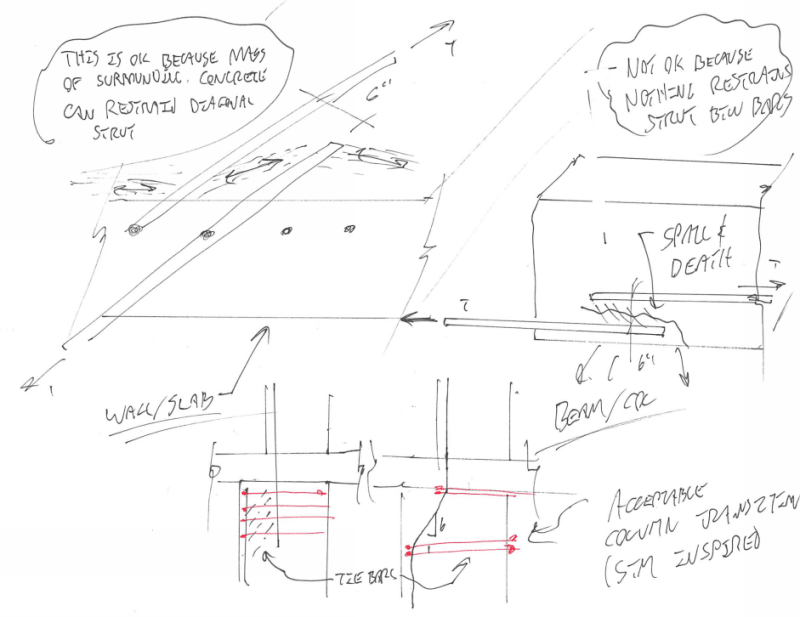 The AASHTO bridge design spec allows "noncontact laps" with up to 6" between bars with no changes to the lap length. However, I saw some research recently that suggests the lap length should be increased over the calculated lap by the distance between the bars (ye olde 45 degree concrete failure in shear assumption/rule). ACI also has 6" (150 mm) or ld/5 as a maximum non-contact splice distance. If you are stepped back more than that in your column situation I would be tempted to simply extend the setback bar far enough into the larger section such that the bar is developed past the development of the bar from below. That might be a bit much but would ensure transfer of the tension loads. Thank you JAE for your info about ACI and your suggestion. That is what my memory tells me was in CSA A23.3, but so far I have not found it in CSA. I will take another look. Thank you Hotrod10 for the info in AASHTO and your suggestion. Sorry if I misunderstood your case. I do not understand why the lapping bars need to have 150mm separation distance if the upper member moves 75mm inward. In any case you can always arrange the compression rebar of the lower member to terminate at the step change level say by L or U bars below the interface so that the lower column is structurally adequate on its own. Thereafter your dowels, which we in UK call starter bars can be firmly embedded in the lower concrete column with the adequate exposed development length above the step change level and at the exact positions to lap with your upper compression steel. The step change is just the kicker joint. Thus your lapping bars are right next to each others. That to me is a structurally sound solution. In construction you can cast the two levels together without the kicker joint at the step change. Have now found where is says in CSA A23.3-2014 (clause 12.14.2.3) about the limit in how far apart the bars can be in a splice, which seems to be about the same as what JAE says is in ACI, but CSA A23.3 says this for flexural members. Does ACI also say for flexural members? I would normally describe a column as a compression member, and not as a flexural member, although it of course must generally resist some flexure. I wonder if this requirement is meant to apply only to tension splices? In ACI it is in their bar development chapter - independent of the member the bar is within. ok, thanks JAE. That is helpful. I would argue that the bars in a column are providing more flexural capacity then straight compression capacity, and therefore that clause should be applicable. Perhaps. But I don't think columns are generally called flexural members. If this requirement of the Standard is meant to apply to both flexural and compression members, why say "in flexural members"? Why not just omit this phrase? I think this phrase must be there for a reason. What is the exact wording in other Standards such as AASHTO or ACI? Do the commentaries to these Standards elaborate on it? 12.14.2.3 Bars spliced by lap splices in flexural members shall have a transverse spacing not exceeding the lesser of one-fifth of the required lap splice length or 150 mm. There it says in 12.14.2.3: "Bars spliced by noncontact lap splices in flexural members shall not be spaced transversely farther apart than the smaller of one-fifth the required lap splice length, and 6 in." A column can indeed be a "flexural" member. Of course. That is what I stated earlier. But that is not what is usually meant when we speak of flexural members. Flexural members are members that are primarily in flexure, and compression members are members that are primarily in compression. No? If it means both flexural and compression members, then why is the phrase included? Would the meaning of the clause be changed if the phrase were not included? I would argue that if both columns and beams were meant, the clause would have been more straightforward and better without the words "flexural members". But perhaps the Clause means "flexural members" in the usual everyday sense, viz members subject primarily to bending and designed as such (such as beams). Be interested in how AASHTO or other Standards are worded. I don't really agree with that. In all code language, if you have flexure in a member, it is a flexural member. Doesn't matter if the axial is more or less than the flexural moment....indeed, how would you compare moment with force? Apples and oranges. Most members are axial-flexural members in any case. And a tension lap-splice is needed because...it is in tension - i.e. you have flexure....thus it is a flexural member. My thought is that the word "flexural" was used to differentiate this from purely axial (hanging) type concrete members where a gapped lap splice may not be all that desirable. the spacing of the shaft transverse reinforcement in the splice zone shall meet the requirements of the following equation..."
An equation defining the limit for "spacing of transverse shaft reinforcement" follows. This would seem to indicate that columns are a subset of "flexural members". Your last sentence is interesting. Perhaps that is the explanation. Mf/Mr + Pf/Pr not greater than 1.00. If the second term >0.50 I would say the member is more a compression member than a flexural member. If the second term is say 0.90, I would say that the member is primarily a compression member. But you have given your opinion, and I respect that. I suspect that the phrase "flexural" is there, as you say, in order to distinguish from pure tension members). The last email that I sent was meant to address JAE. I had not seen Hotrod10 message at that time. To Hotrod10: Thanks. That seems better, clearer and more careful wording than in ACI or CSA. But since I don't see the word "flexural" in what you have sent from AASHTO, I am not following how you conclude that it indicates that "columns are a subset of flexural members". However if that is how you see it, I won't argue the point. Your opinion is as good or better than mine. Thanks again for the help. I will adopt the most conservative interpretation which is yours. My conclusion that columns were a subset of flexural members is based on the way in which the provisions are arranged. 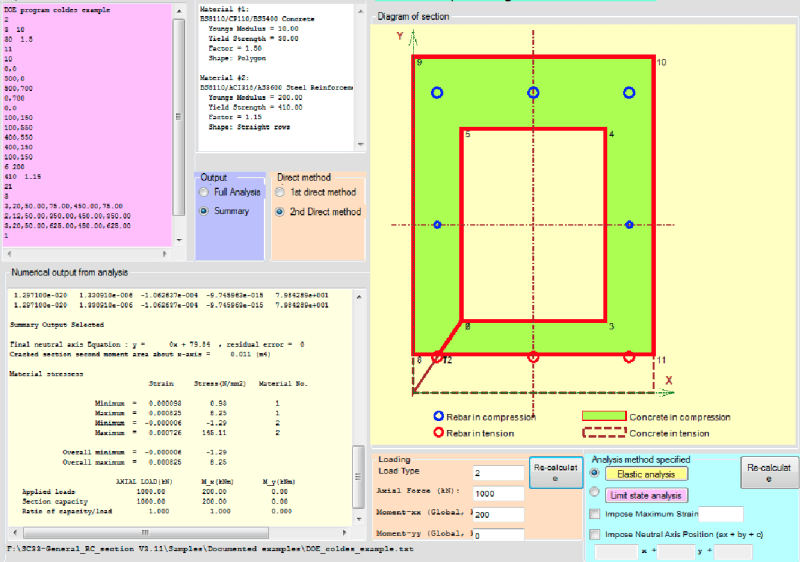 It allows non-contact laps in flexural member meeting the 6" or 1/5 lap length criteria. Then, it goes on to allow columns (connected to drilled shafts) with non-contact laps not meeting that same criteria, provided they meet the criteria in set forth in to equation that follows. To me, that identifies columns as included with the flexural members, because otherwise there are no provisions regarding a non-contact lap in a column where the space between bars does not exceed the 1/5 lap length or 6". In my opinion, the offset lap splice business is for planar elements in the plane of those elements. This, for the reasons shown below. I wouldn't dream of relying on this in a concrete column that's likely to creep and transfer a disproportionate amount of its compression to the rebar. Below, I've also shown what I consider the two sage ways to handle the offset. This is effectively the same reason why we never transition 12" CMU retaining walls to 8" part way up. What is the source paper of this study? Was there any follow-up discussion by others in a Journal? There's a link to the source paper provided in my last post ajk1. @ajk1: For what it's worth, I actually agree with your take on the "for flexural members" thing. While I don't have complete faith in code writers -- particularly Canadian code writers -- my default stance is to take what is written as having been purposeful. And my read on it, from a semantic perspective, is the same as yours. The question then becomes why should the offset lapping only apply for flexural members. The code doesn't make that clear in my opinion but, as usual, I have a theory. I think that it's got to do with the creep in axially loaded members that I mentioned above. 1) At service loads, bar stresses will be low. 2) While not always mandatory, standard detailing practice usually has splices placed where peak bar tensions are not. With a predominately axially loaded concrete column, both of these nifty features go to hell in a hand-basket. There are no low demand locations for axial load so #2 is shot. And creep will draw substantial compression to the rebar so #1 is not reliable either. It's kind of a weird thing in codified concrete design in that we don't really seem to have faith in lap splices, even with transverse reinforcement, when the demand for them is high and ever present. This shows up conspicuously in the clause related to tension members that prohibits the use of lap splicing altogether, even with ties/STM. I get that almost every member will have some flexure in it but I still feel that there are members out there that are predominately axial and therefore may be worthy of differential treatment. To paraphrase a past comment from Hokie66 that has stuck with me: high-rise columns don't care about moments. The bars in such columns do in fact have an important role to play in compression resistance. It's only low-rise and and upper story columns where the rebar is playing an important role in resisting tension. I think the need of rebar splicing in tension is different from compression. Let's say if we can use some high-tech means, like high power water jet of laser beam, to clean cut a column in the middle and stack them up as before. The two-section can take axial load nearly as much as before as long as the two sections are restrained laterally without any displacement. The rebar bearing on each other can take same level of stress as before as each bar is well confined. So is the concrete. By severing the column into two halves the stack-up column effectively has no rebar splicing. In the reinforced design concrete is assumed no resistance against tension so in the tensile zone below the neutral axis we have just the rebar and no concrete area to contribute tension to balance the applied load. In reality we can allow the concrete section to crack and the member will work as long as the rebar below and above the cracking plane is bonded successfully to concrete with adequate development length. If a column has to resist a modest bending moment then it will have a neutral axis with tension and compression zones with some rebar in small tension. @ajk1: For what it's worth, I actually agree with your take on the "for flexural members" thing. On this too I agree completely with you. There are many (most?) columns where the rebar takes a very significant part of the axial load. I find Hotrod10's reasoning round-about and unpersuasive. Saikee119 has totally lost me. I suppose the only way to be sure is to write to CSA and ask them (that will likely take a long time to get an answer back) or to call someone I know on the CSA A23.3 technical committee. Frankly, I think the issue arises most probably because of failure to use the best wording in the clause. I suspect that it applies to compressive splices in columns, but they screwed up the wording. Maybe they meant "compressive members and flexural members, but not tension members". I spoke to one of the academics on the CSA A23.3 Technical Committee and he says that CSA A23.3 Clause 12.14.2.3 does not apply to columns except if the column rebar is in tension. He says lap splices are different in tension than compression, and the bar separation specified by the Standard for contact tension splices do not apply to compression splices. So it appears my original reading of the Standard was correct.